The one time I went snorkeling was probably the single most amazing thing I’ve ever done in my life. 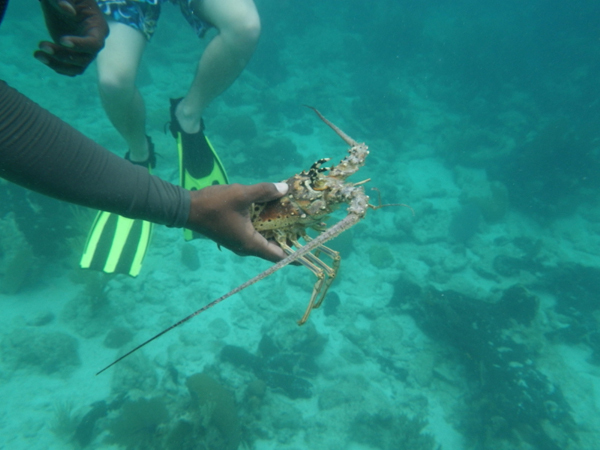 Snorkeling was our second off-resort adventure in Belize. Instead of leaving on a bus, we left on a boat. But first we took a trip to the surf shop to get fitted for flippers and masks. Everyone involved in that process was upbeat (despite the early hour of the morning). These were people who clearly loved their jobs, even the part that involved putting four or five different pairs of giant floppy shoes on tourists who just rolled out of bed. I’ll admit to being chicken; I didn’t plan on snorkeling when we made the plans. I was going to sit on the beach and read with my mother-in-law, who had a previous bad experience snorkeling and didn’t want to do it either. But our guide was phenomenal. I wish I could remember his name so I could properly credit him for his amazing amount of patience. When we expressed our anxiety about getting into the water (fire coral and jellyfish? No thanks! ), he reassured us he’d do his best to point out everything, and that he’d go first in case there were dangers around us. After that he spent about half an hour helping us into our flippers and masks, letting us test them so that we’d trust them, and he even gave us life vests so that we’d be more comfortable. By the end of all that, I was already convinced the guy was a saint. 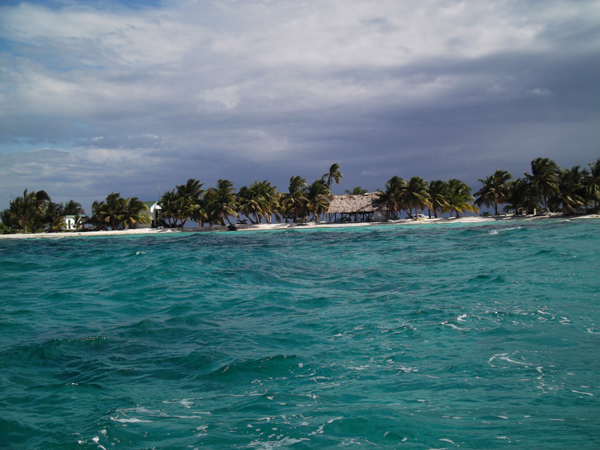 Our snorkeling destination was Laughing Bird Caye, which is a national park located about eleven miles from Placencia. At it’s widest, it’s probably about thirteen feet wide and about double that length. It consists of a park ranger station, a pavilion of picnic tables, a pair of bathrooms, and conch shell lined paths connecting them. One part of the island is reserved for the Laughing Gulls which nest there. This little island is beautiful. You could circle it (minus the part reserved for the gulls, which is separated by a very narrow strip of beach from the rest of it) in about fifteen minutes at a slow pace. 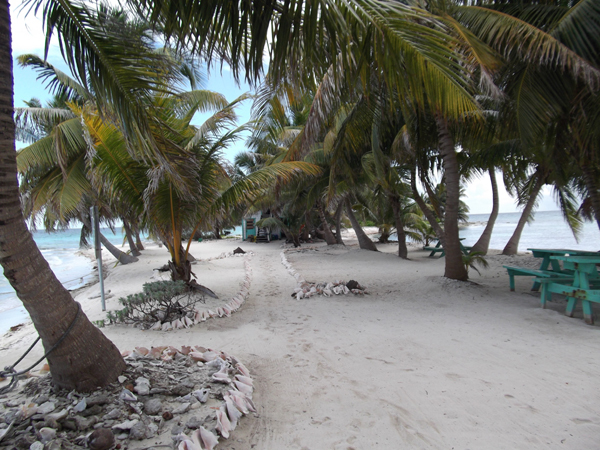 The rules for Laughing Bird Caye are simple (and beautiful); Take only Pictures, Leave only Footprints. We were the first group to arrive. Our guide was very pleased about that because it meant we got to see the local wildlife before it was disturbed. My in-laws invested in an underwater camera shortly before our trip, so my father-in-law took all the pictures of our snorkeling experience. And what an experience it was! We weren’t exactly surrounded by fish, not the way divers sometimes are. 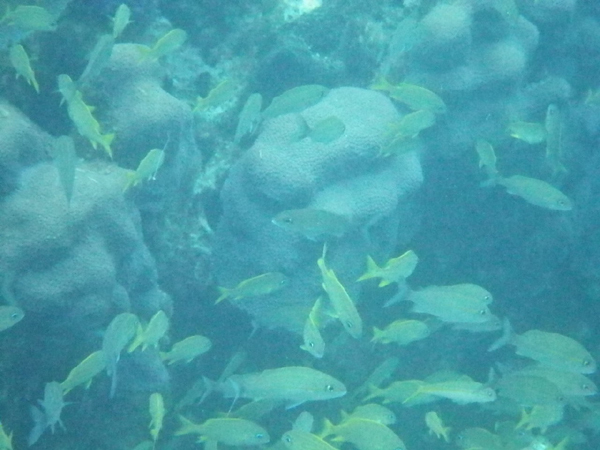 But we were certainly above schools of different types of fish in and around the reef below us. Our guide would swim down, point to something, then swim back to the surface to tell us about it. 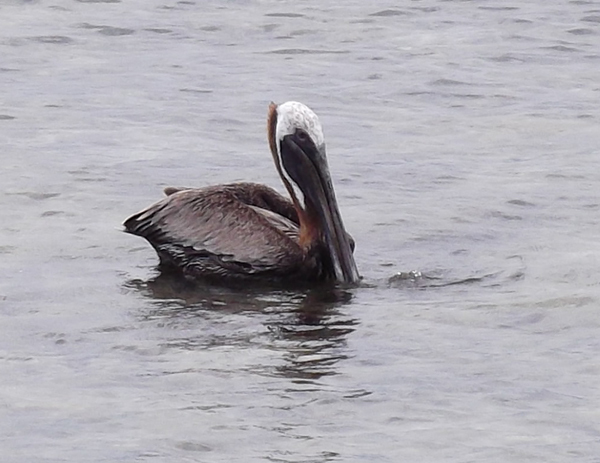 Sometimes he would swim down and scoop something up for us to get a better look at it. This is how I came to pet a sea cucumber. They feel surprisingly furry. I can’t remember all the different names of the fish, and there were many, but I do remember the highlights. 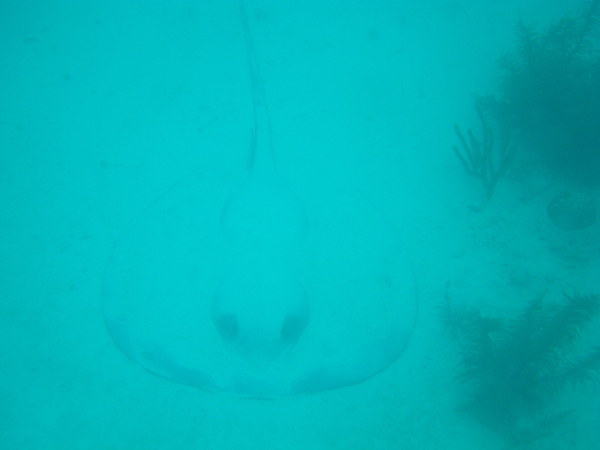 On our first excursion we saw two big manta rays. One had burrowed slightly into the sand at the bottom of the ocean. He wasn’t disturbed by our passing (though we gave him wide berth). We saw another manta swimming as we passed nearby. Manta rays are some of the most beautiful creatures I’ve ever seen. It looks a great deal like they’re flying underwater when they swim. We saw one lion fish (unfortunately we were never able to get a good picture of it). They’re very shy and also poisonous. 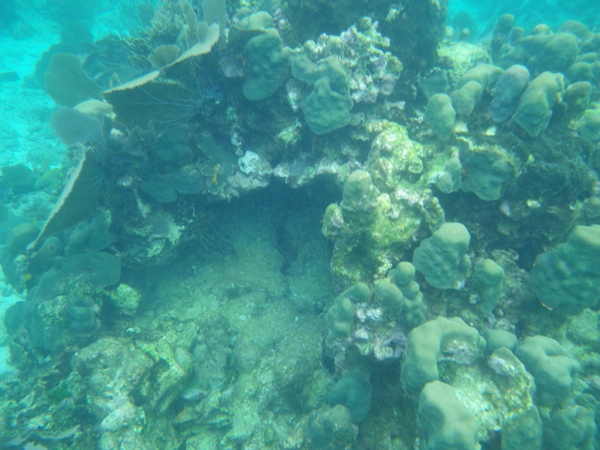 Our guide swam near the reef where it was hiding and tried to startle it into an area where we could see it. We did get a decent look at it but, of course, our guide was careful so as not to put his life in danger. We saw both the discarded shell of a lobster and a lobster. We also saw a spider-crab. Our guide caught it and held it up for us to see and then carefully put it back when we were finished looking at it. He told us a story that when he first came to work at Laughing Bird, he did a tour and simply let the creature he was showing go when he was finished talking about it. Unfortunately a snapper (one of the most common fish in that area) came by and snapped it up. He explained that all the guides do their best not to disturb the wildlife – they want it to be as if no humans were ever there. So he always takes everything back to exactly where he found it so he knows the little critters are safe. Aside from the five of us, there were only two others with us for snorkeling that day, a father and son also from Canada. 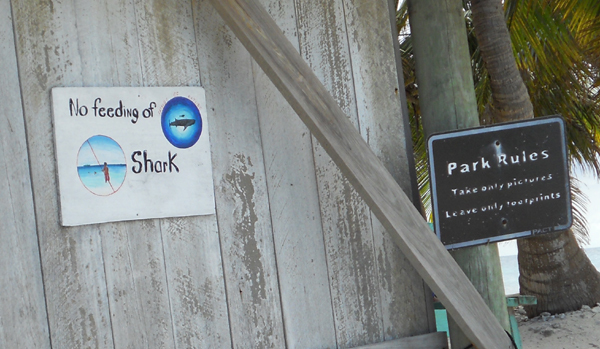 They were both very nice and also experienced snorkelers. Neither of them were shy about swimming lower and a few times they pointed out things to our guide. We spent lunch getting to know them a bit before we went back in the water. 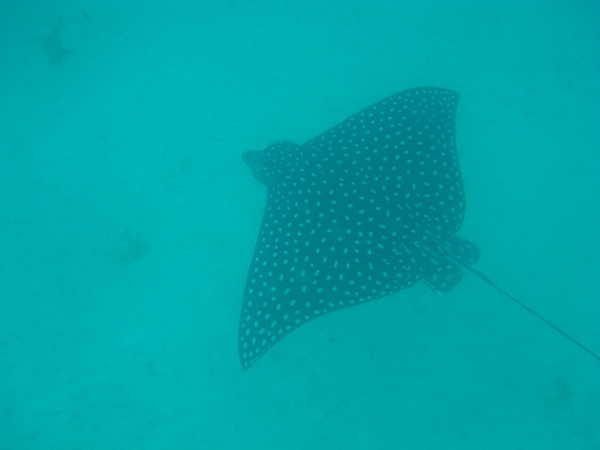 Much to my delight, we saw a pair of younger, smaller manta rays swimming in the afternoon. Amazing! We finished in the early afternoon and headed back to our boat. By then a storm was rolling in and our guide wanted to be back to the resort by the time the sea got dangerous. There was bad enough weather a few days we were there that snorkeling had to be canceled (for the protection of the guests), but we were lucky enough never to run into it. My husband snapped a good shot of the storm rolling in as we took off, but luckily we outran it and didn’t have to rush back. Doubly lucky for us because perhaps the most amazing encounter happened on our way back to the resort. Bubbles (our boat driver) cut the engines. He thought he heard dolphins and he thought if we stopped they might show themselves. He was exactly right! At first we only saw one, but by the end there must have been three or four. For about twenty minutes we would move a little, then stop for awhile, and the dolphins would surface and swim around our boat, playing with us. The son in the duo with us was brave enough to lean out over the front of the boat and hold out his hands, to see how close they’d come. One of the dolphins surfaced so close they couldn’t have been more than a foot or two away from his outstretched fingers. I’ve seen dolphins in captivity before and they’re majestic, but nothing compares to interacting with them in the wild.